Disclaimer: This post isn’t full of informative insights and it doesn’t describe anything that will be very impressive to experienced adventurers. But for me it was an amazing experience, and it is as much for my memory as it is for your enjoyment. Sorry if the details get boring. My last week in Condor Valley was incredible. Bruno and I saddled two horses and road up 2000 meters to the Puesto (cottage) on Mt. Crestón. My legs are still sore from riding for two days straight, and I still have scratches from thorn bushes I couldn’t avoid, but the experience was worth it. It’s true that I didn’t have much time on the mountain, and there was plenty I would like to return and see. Nevertheless, the way I experienced it was unique. I wouldn’t change it. Wednesday morning we woke up early and saw that the entire valley was flooded with mist. Even after catching and saddling the horses we could barely see a few meters ahead. The mist only got thicker as we climbed up into the clouds, and it made the journey seem surreal. Hills, mountains and cliffs loomed suddenly into view and then disappeared behind in seconds. For months I had heard about the beautiful landscapes that could be seen, and, clinging nervously to my horse, I wondered whether I would have the chance to see them for myself. 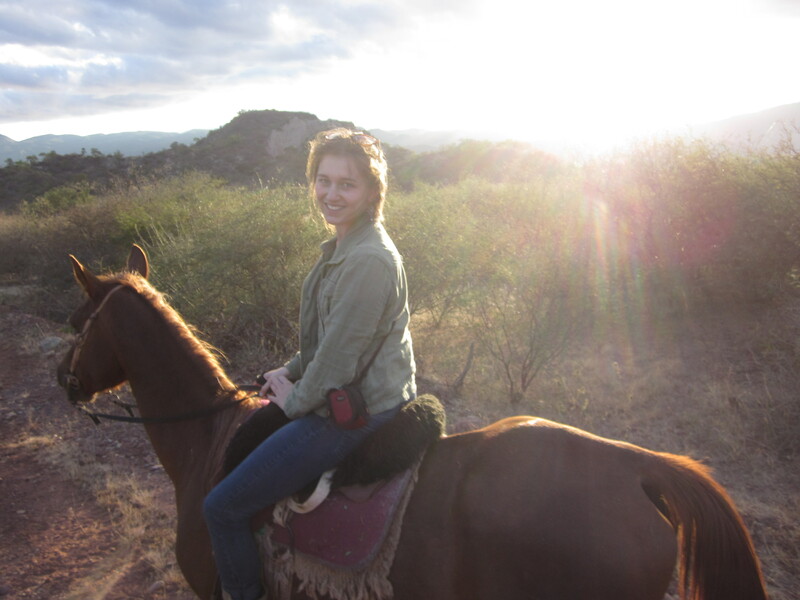 The trail to the Puesto was also the most challenging riding I had done, and on a less stable horse. Two or three times he jumped suddenly (probably my fault) and I barely stayed on the saddle. At other times we had to bring the horses to a run to build momentum before going up a steep slope, and then pray it was enough to make it to the top without slipping. More than once I told myself I only had to survive the next 48 hours and then it would be smooth sailing till my flight back to Chicago. Maybe I wasn’t the only one: by the end of the climb our horses were drenched in sweat. Luckily, Bruno is an incredible guide, and we arrived at the Puesto in time for a late afternoon lunch. Just as we dismounted and began to unsaddle the horses the sun made a brief appearance, and from then on the tone of my adventure began to change. 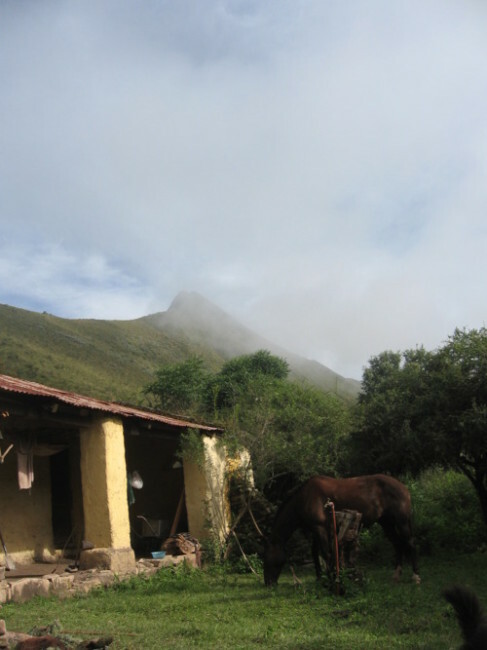 At the Puesto we collected firewood, made lunch, unsaddled the horses, prepared beds for the night etc. 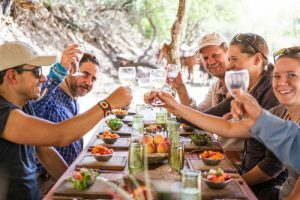 It felt like a mixture between camping, animal care and arriving home. After lunch we began work repairing the ditch that brings water to the Puesto from a stream above. The impact that the difference in oxygen had on my ability to work was surprising. Every few minutes of shoveling or clearing space with the machete I had to stop, breathing hard, and after an hour I was soaked in sweat. While we worked, the mist intermittently began to clear, slowly revealing the hill (more or less 1500 feet high) at whose base the Puesto sits. The hill is called El Cuchillo, (which means “knife” in Spanish), for its razor-thin edge. We rebuilt the fire and started dinner. While I cooked some rice Bruno made me Yerbiado, the ingredients of which are: Mate (a local tea), mountain water, several herbs we found growing nearby, burnt sugar mixed with ash, and 100% pure ethanol. It was delicious. We sat by the fire, played cards, talked about many things, and watched the clouds slowly lift, revealing one star at a time. Then we went to bed, with the dogs warming our feet. I woke up in the middle of the night (for reasons related to the Yerbiado) and the clouds had fully cleared. The sky was so full of stars it looked like it was one ubiquitous blanket of blue fire. The milky way streaked through like glowing pixie dust. The temperature had dropped and the grass had a layer of frost that reflected the light of the stars. That moment (and that urination) is one I hope I never forget. I sat outside until I was shivering, watching the stars with Fernet (the dog who was sleeping at my feet) and then I went back to bed. I can’t find more words here, except to say it was just so so incredibly great. The next morning we prepared to head home, and then decided to climb El Cuchillo by foot. It took about an hour to get to the top, (stopping often because of the air). The sky was still crystal clear, and we could see for miles. Incredibly, everything we saw was still within the property of the farm. From the top of the hill it was clear how far the cattle herd had scattered in the highland pastures. Some cows were close and others were specks. Some had managed to climb into impossible positions. Still, the area looked more or less like a cow paradise, with huge fields of gorgeous grass that towers in terraces over the rest of the property, stopping suddenly at the edge of a cliff, like an infinite pool of pasture. At the top, the hill justified its name: the ridge was so thin I could straddle the peak like a horse. After a few minutes there, and a few glances down, I told Bruno I would like to head back down. The ride back showed me everything I had missed on the way there. The sky remained clear and I saw the incredible views I had heard about, and I got to appreciate more closely how the elevation changes everything from the vegetation to the air, the rocks, the water. It was like riding a horse to another planet. We reached the farm safely, the horses were thrilled to be back (it was all I could do to keep mine from galloping), and so was I. But even in the first hours back I began to appreciate what I had experienced. When we left the farm the mountain was completely covered in mist. Slowly the fog lifted and I discovered new parts of this incredible property. I think I enjoyed it more because it was given to me in this way, like a mystery novel, with tension and uncertainty that heighten the senses. Tomorrow is my last full day in Argentina, and I hope that after it, and the next days and weeks I won’t forgot this experience. If you made it this far, thanks for reading. How do you end a post like this? I don’t know, but good night.